Last year, Amazon was granted permission by the Indian government to invest $500 million in a wholly-owned venture to sell local produces and packaged food items through online and offline mediums. Amazon is gunning for a hat-trick to take on the escalating omnichannel competition in India. 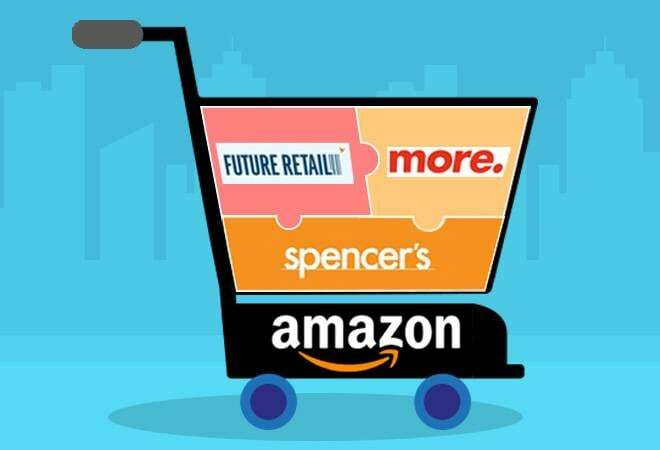 Apart from a 10% stake in Kishore Biyani's Future Retail Limited (FRL) and joining a consortium to buy out Kumar Mangalam Birla's food and grocery supermarket chain More, the world's largest online retailer is now reportedly eyeing a minority stake in Spencer's Retail. "Talks with Spencer's on valuation and structure are currently ongoing," an executive with knowledge of the matter told The Economic Times. "They are preliminary in nature, so we can't be sure that the deal will go through." Amazon's two-pronged move into the grocery space makes sense since its ambitions of being the first foreign e-tailer to sell food items directly to customers have been a non-starter due to policy ambiguities. To remind you, last year, Amazon was granted permission by the Indian government to invest $500 million in a wholly-owned venture to sell local produces and packaged food items through online and offline mediums. Though Bezos has reportedly invested about Rs 100 crore ($14 million) in that business - under Amazon Retail India Pvt - things are yet to gain traction. Citing sources, the daily added that Amazon has realised it will take time for the above venture to develop since it's a difficult business to make profitable without a presence in other categories. So while the Seattle-based ecommerce giant bides time, such strategic investments in top brick-and-mortar chains are sure to come handy. "Without the support of brick-and-mortar chains that already have stores in all cities including the tier II and III markets, it will be difficult for Amazon to expand its play in food and grocery retail across the country," said an executive. In addition, the move will help Amazon save on margins. According to Knowledge@Wharton, it's not just the size of the grocery pie that is attractive to e-tailers - expected to grow to $3-5 billion in the next three to four years - but also the stickiness. Groceries and fresh produce are an essential purchase for every household. They are bought frequently and with a high repeat rate. "If FDI rules on multi-brand retail get liberalised, Amazon will look at full ownership in some of the chains," an executive told the daily, adding that it has made a similar offer to Spencer's Retail and others. In the meantime, the strategy is reportedly likely to unfold through Amazon's Prime Now, which promises two-hour to same-day delivery of food and grocery. The hyperlocal platform is currently present in four cities, Mumbai, Delhi, Hyderabad and Bengaluru. A stake in Spencer's Retail, India's third largest hypermarket retailer, will give Amazon access to its 128 stores - 58 large ones and 70 smaller ones - across 30 cities. What's more, in an investor presentation in March, the company announced plans to roll out around 40 hypermarket stores over next four years. In the last fiscal, the company reported revenue of Rs 2,091 crore while net loss dropped to Rs 30 crore, down from a loss of Rs 129 crore in 2016-17. The company hopes to break even in the current fiscal. Spencer's Retail is a subsidiary of RP-Sanjiv Goenka group's flagship company, CESC Ltd. The latter recently got the green light from the National Company Law Tribunal (NCLT) for the demerger of the business into four entities. Sources told the daily that Spencer's Retail - which will then become a separate listed company - has plans to raise funds subsequently, with the promoters looking to dilute a minority stake. If Amazon successfully closes all three deals it will reportedly have a stake in over 1,700 stores as well as access to a mine of data to further its business in India. Both factors will help it compete effectively against rivals like Walmart-Flipkart and Reliance Retail. Moreover, Alibaba, which has invested heavily in India in the payment and retail space through Paytm and BigBasket, is also seeking local retail partners in top domestic conglomerates.